Mrs. Rhonda Cooley, 62, of Radcliff, KY, died on April 28, 2018 at her residence. Mrs. Cooley was a native of Carrollton, GA and the daughter of the late Foster and Eddie Lou Horton. 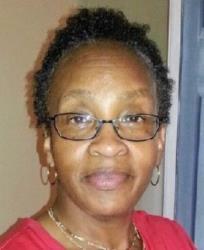 She was a member of Hope Temple Church of God in Christ in Radcliff, KY. In addition to her parents, Mrs. Cooley was preceded by one brother, Aaron Horton. Survivors include her husband, Fregodfrey Cooley of Radcliff, KY; three daughters, Sheklia McClarity of Radcliff, KY, Donna Maynard (Jerome) of Vine Grove, KY and Nicole Cooley of Bowling Green, KY; one son, Raymond Cooley (Heather) of Elizabethtown, KY; three sisters, Constance Horton, Rita Horton and Carroll Ann Almon all of Carrollton, GA; two brothers Raymond Horton and Freddie Horton (Patricia) of Carrollton, GA; seven grandchildren and two great grandchildren. Funeral Service will be held at 2:00 pm on Saturday, May 5, 2018 at Hope Temple COGIC in Radcliff, KY. Burial will be Monday, May 7, 2018 at 11:00 am at Kentucky Veterans Cemetery Central in Radcliff.